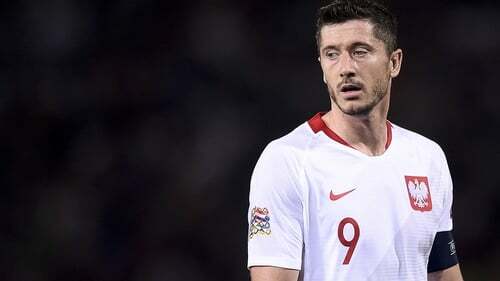 Poland manager Jerzy Brzeczek has warned his players not to treat Tuesday night's friendly clash with the Republic of Ireland as a party for Robert Lewandowski. The 30-year-old Bayern Munich striker could win his 100th senior cap at the Stadion Miejski in Wroclaw, but Brzeczek refused to reveal whether or not that would happen at his pre-match press conference. Indeed, he urged his team to beware a wounded Ireland, who have endured a difficult week amid differences of opinions within the camp, an injury crisis and a dismal 4-1 Nations League defeat in Wales on Thursday evening. Asked if the unrest may work in Poland's favour, Brzeczek said: "Absolutely not. We don't deal with the injuries of the Ireland team because we know that Irish people are very proud, very belligerent. "Even thinking that you can win against Ireland without full engagement could be a huge mistake. We have huge respect and we know that 90 minutes of a very good game will decide who is going to leave the pitch as a winner." Paris St Germain midfielder Grzegorz Krychowiak was also quick to dismiss suggestions that Ireland, who were edged into the play-offs for the Euro 2016 by a 2-1 defeat in Poland in October 2015, will be there for the taking. Krychowiak said: "Each time we play the Irish team, those matches are very difficult. In order to achieve a positive result, we know that we have to play very aggressively. "But it's very important for us to make sure we are supreme in terms of our skills because that is the way to win tomorrow." Brzeczek revealed he has a series of injury doubt and will make late checks before he names his team, hence his reluctance to confirm captain Lewandowski's presence or otherwise. Krychowiak admitted the players had not prepared a celebration as a result, but promised that the 55-goal frontman's achievement would not go unrecognised. He said: "We haven't prepared anything yet. As the coach said, we're not 100 per cent sure yet that he's going to play. "The time will come for that and definitely something interesting is going to happen." The Poles going into the game in confident mood on the back of their 1-1 Nations League draw with Italy in Bologna on Friday evening.